Students are facing a battlefield of differing opinions in the world of personal finance. When you don’t have the greatest financial background in the world, it can feel like every side is making good points. It can also feel like you should just be a sideline observer. You can always get credit when you’re older, right? Well, the truth is that you’re going to have to prove yourself in order to work your way up to the supposed ladder of personal finance. You can’t get a home loan if you haven’t proven that you can handle smaller amounts of credit. If you really think about it, this makes perfect sense. No one is going to trust you with the keys to a brand new sportscar if you’ve wrecked six normal cars. You’re proving that you can’t handle the basics when it comes to driving. Well, the credit card companies have realized that there’s a connection between a good credit file and someone who is going to make their bills every single statement cycle. If you’re someone that doesn’t have good credit, it is most likely linked to paying accounts late — or worse, not at all. You have to make sure that you are educating yourself about credit in all of its forms. A lot of people are so afraid of credit that they refuse to get any at all. This is a short sighted view. What about when you’re ready to get a vehicle? You’re not going to be able to do anything because you haven’t established any credit history. What if you fell into a bind and you needed to borrow money quickly? There are payday loans in one hour, but that doesn’t mean that you want to get those either. The reality is that you have to have good credit to get a loan that you can actually pay off. Payday loans have high interest rates, far higher than any credit card. Even if you only wanted to have a credit card for travel and emergencies, you could do that. You would still save a lot of money in terms of interest costs. Interest, as you will remember, is completely profit to the credit card company or the loan company that gives you the payday loan. 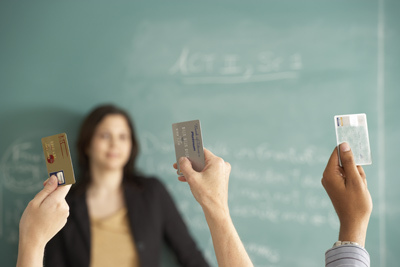 Now is the perfect time to get not only educated about credit, but personal finance in general. Where do you want to take your life? What do you ultimately wish to do? You will find that it’s going to take time to really answer those questions, but they are definitely worth exploring.